I'm sure you're familiar with those types of people who are always there when you need them, through thick or thin and everywhere in between. Meet Elizabeth Eugenio, whose loyalty to her friends, family and clients knows no bounds. When a challenge arises, Elizabeth is the one they rely on to help them see it through successfully. She can always be counted on to get the job done, and done right! Elizabeth began her real estate career in 1991. Since then, she never stopped learning and improving her skills by attending classes and earning designations so she can better serve and counsel her clients. One of the most important education and training she received is the Certified Residential Specialist (CRS) a designation earned only by less than 4% of Realtors in North America. A CRS earn this credential from the Council of Residential Specialist by completing extensive training and demonstrating significant experience in managing the increasingly complex real estate market, help you get the best price for your home, have the negotiation skills to limit legal and financial risks and ensure a successful, worry-free real estate transaction. Born and raised in a very close-knit Fililpino family, she places a great amount of importance on spending time with her five children and seven grandchildren. She is a firm believer in giving back to her community so she often volunteers at her parish, St. Paul the Apostle Catholic Church. 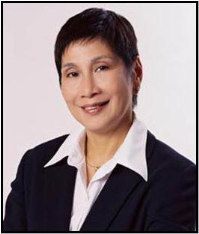 She is also a member of the Filipino American Senior Association (FASA) and is a founding member of the Chino Hills Rotary Group of Chino Hills. Elizabeth graduated from Maryknoll College in the Philippines, then proceeded to transfer to Marquette University in Milwaukee, Wisconsin, where she earned her bachelor's degree in psychology. There are certain moments in life when you need someone you can trust and that you can count on; buying and selling a home is one of them, whether it is your first or fifth transaction. Perhaps that is the reason why more people turn to Elizabeth for their real estate needs. They are assured that once Elizabeth goes to work for them, she will be there every step of the way, from that first consultation to the closing- and following up on that closing. Her caring nature, excellent customer service and devotion to realizing their goals is what has made her one of Chino Hills' leading real estate professionals. Elizabeth is The One To Count On in Real Estate!